May 2013 – Tools for strategic and strong-minded thinkers! Strategic thinking is a style of thinking that – among other things – is concerned about the future. When done well, we could say that strategic thinking makes a person more “futures ready;” that is, having an attitude that is comfortable with change, anticipates change, and proactive with responses. Unfortunately, this futures-ready stance is not common. However, we can train people to be more futures ready. This article provides an approach that starts with the individual. In 1998 mobile phones were gaining widespread use. Could you have imagined how they would have taken over functions like time keeping, photography, and gaming? Could you have imagined laws being promulgated to restrict texting while driving? In 1998, would you have imagined that any of your friends or family would have died “before their time?” I can say – based on my own experience with a death of someone close to me – that it makes a lasting impression and causes a re-thinking of priorities. In 1998, most babies in the US were born to parents married to each other. Today, more are born to single women than to married parents. Would you have predicted that? In 1998, would you have imagined a terrorist attack on US soil that would have changed the structure of government, airport security, and entry into sporting events? The scope and far-ranging impact of the 9/11 attacks has created all kinds of change to the daily life of Americans and others. I have conducted the above thought experiment with many people, and note this pattern: the person realizes that the amount of change has been astounding. One person called their experience with change, “jaw dropping.” These memories and reminiscences can be quite strong and stimulate some interesting conversations; but, the point is to get them to shift their thinking towards the future. Now, some readers would answer the thought experiment with this response, “Sure, I could have imagined this.” However, you probably didn’t. You were probably concerned with the joys and problems of your life at that moment in time. You were (and are) probably like most people: you the present time is your reality. It is concrete, whereas the future is an abstraction that gets little of your attention. After looking 15 years into the past, I next ask them to imagine 15 years into the future. If I want to really stimulate their imagination (or aggravate them), I ask them to imagine as much “jaw dropping change” for the future as they recall for the past. This is difficult, and requires encouragement. Most people think tomorrow will be more of today. They develop views of the future that linear extrapolations of the current condition. Let’s put the 15-year span into perspective. Home mortgages are typically 15 or 30 years. Some people own their cars for 15 years and are even wearing the same suits and shoes. Fifteen years is the lifespan of a family dog. Those examples show us that 15 is an understandable span of time. The following questions are about the future, and have answers that require only a bit of arithmetic and imagination. Write down your answers to these questions. What is your age in the year 2028? Imagine your parents or grandparents at that age and their physical and mental health? How old will your children be? How many years has your organization (employer) been in business in 2028? Expand your answers with some written words or images. Linger on this description, engaging your intuition; does it feel right? Then try to look at that future with a different perspective and consider other questions that might help you with envisioning. Invariably, the discussion of the future brings in trends and forecasting, so go ahead and make note of the them. The typical list includes: climate change, wearable technology, population growth, nations that we now consider developing are fully developed, more weapons (international and domestic), and more globally-interconnected communications. Futurists recommend that any futures-ready view include a “wild card scenario.” Consult the above thought experiment placing you in the year 1998: terrorist attacks and the Great Recession might qualify as wildcards: extraordinary events that might be difficult to anticipate but have far-ranging effects. Here are a two ideas for wildcards that could disrupt life as we now know it: pandemics and a large meteor strike. Here is one more exercise for your imagination. Imagine two futures. One is optimistic and wonderful. It is the ideal world. The second scenario is one that is more pessimistic. Explore what that scenario is like for you personality, your organization, and your network of friends, family, and social organizations. Emphasize the impact of the scenario, rather than the probability of occurrence. Earlier I noted that people don’t do as well with future imaginings compared to past rememberings. One reason is that people tend to remember things that are recent, concrete, and salient. This is often referred to as the anchoring bias. A second reason is that the future is ambiguous and people tend to be ambiguity avoiders. People prefer to think and talk about things that they have evidence for, and avoid things that don’t. What is most real? The present. This shows up as status quo thinking. 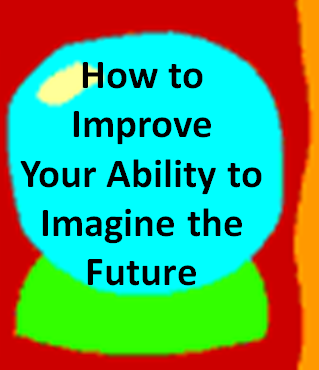 Recognize it as a barrier, and apply both imagination and analysis to developing a view of the future. These thought experiments add value to your strategic thinking because they place patterns and ideas into your memory. Your subconscious works with these concepts by recognizing patterns and producing insights.